Rattray joined community partners, elected officials, school supporters and staff to celebrate the grand opening of the 22nd Educare early childhood school on November 1. Educare Los Angeles at Long Beach will provide low-income children with quality early learning during their first five years to prepare them for success in school and life. 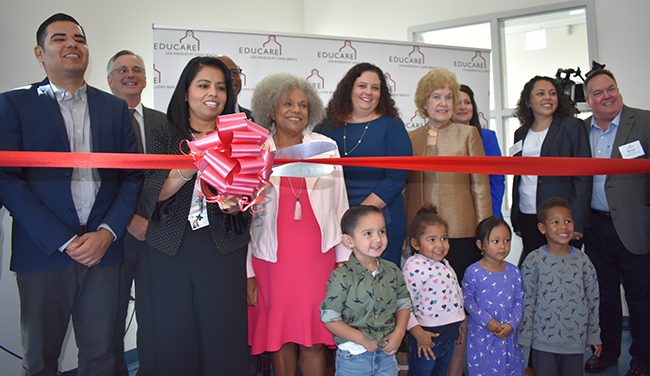 Educare Los Angeles at Long Beach opened its doors to nearly 200 young children, ages 6 weeks to 5 years old, and their families this summer. Educare Los Angeles at Long Beach is a platform for change in early childhood policy and practice to increase access to high-quality early education for all children. The school was formed in partnership with Los Angeles Area Chamber of Commerce and UNITE LA, Long Beach Unified School District, Long Beach Education Foundation, LA Partnership for Early Childhood Investment, The Advancement Project, Buffett Early Childhood Fund and Ounce of Prevention Fund. Watch a highlights video of the event.